New in 2.2: Configuration expanded with weather, light, and multiple-block requirements. 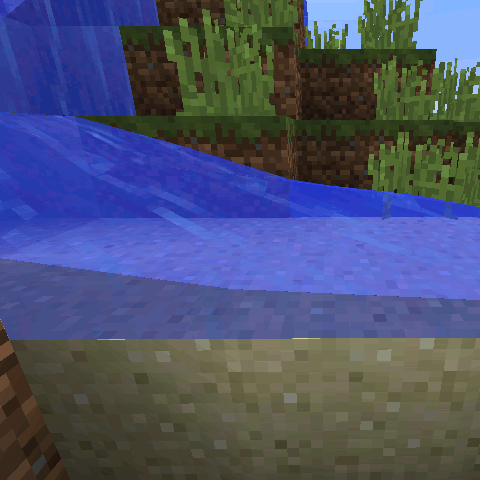 Certain blocks will erode when there is water above them. When under flowing water, stone will become gravel, dirt will become sand, and undyed hardened clay will become red sand. When under still water, sand will become clay. Also, Cobblestone and Stone Bricks will grow moss when adjacent to water. As of 2.2, rain will turn hardened clay soft, and the sun will bake soft clay into hardened clay. The original purpose of this mod was to add a renewable source of sand and gravel. It has since been expanded with powerful configuration options. Note: because of the way this mod is programmed, no erosion will occur until the erosion is triggered. Erosion will never trigger if there are no players nearby. Once erosion is triggered, it will spread to adjacent blocks. Is there a way that you can add the biome type as condition? Only noticed the time since the last update now.. At least the mod still works. Does any one knows another mod like this? Been a while since an update...any chance of getting this open-sourced, in case someone else wants to continue working on this concept? Is it possible to register multiple blocks the eroding block needs to have to erode? Derp. I was looking at the old config. Disregard my previous comment. Is it ok if I include this in my modpack? I'll provide a link to your mods Curseforge page and credit you as the author. How do you register liquid blocks? It does not seem to work for me. Trying to turn a block into lava in the nether. Hey! Can you make this for 1.7.10? May I use this mod in a modpack? Thank you for great mod! It really makes minecraft more lively and realistic. But can you make 2.2 version for 1.10.2? Light and weather settings are so cool. I've observed that erosion starts immediately right after I walk on the blocks that the water is on. Is this intended? It's a result of how my mod searches for blocks to erode. I think I originally made it behave that way to make testing easier, but I never thought to remove it. I'll make it configurable in the next update, disabled by default so the erosion feels more random. I see. I thought it was a lag prevention mechanic. You can configure that part out if you like. Is it compatible with weather2?